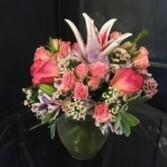 Shades of pink roses, pink spray roses, stargazer lilies, alstromeria, and greenery create a beautiful look for any occasion. 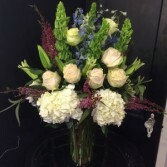 We create custom arrangements weekly for our local churches. This one will grace the altar of a local church this Sunday. Call today and let us create something special for the altar of your church!